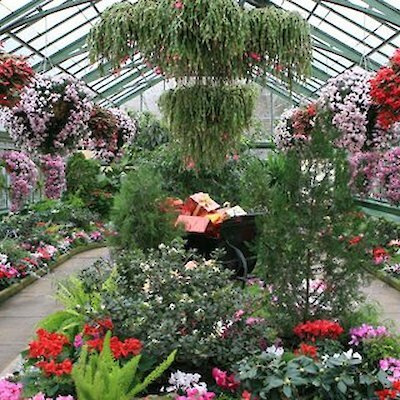 The Niagara Parks Commission once again has their Christmas exhibition in place in the Floral Showhouse (many of us still think of it as the NPC Greenhouse) along the upper Parkway just above the falls. 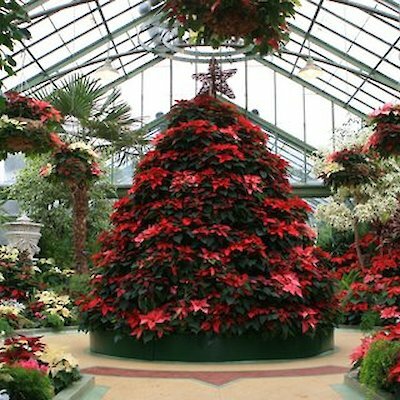 The focal point of the display is the stunning poinsettia tree that includes 150 potted plants topped with a golden star. Beneath the tree are miniature houses and toys which helps create the Christmas magic. The floor of the greenhouse contains pink, red and violet cyclamens, feathery ferns, more poinsettias, conifers, and Christmas cactii. I’ve attached a few photographs of the displays. Admission to the Showhouse is $5.00 for an adult, $3.75 for children over 12 years. The greenhouse is open daily Monday to Thursday 9:30 to 5 pm. On Friday and Saturday it’s open until 8 pm. There is also a fee for parking.